One Piece is a long-running manga series from Eiichiro Oda that has remained famous all over the world ever since its debut, and its anime adaptation by Toei Animation is arguably even more popular than the manga itself. Yet, for as renowned and popular as the series is, its foray into the world of videogames has been fraught with mediocrity, disappointment and some genuinely awful games—One Piece: Treasure Battle! is a Mario Party-like nightmare—and the One Piece games that flirt with quality are ever only just okay at best—the One Piece: Pirate Warriors series and One Piece: Unlimited World Red, specifically. It seems that Bandai Namco may finally be releasing a One Piece title worthy of the IP upon which it’s based in One Piece: World Seeker. Not a whole lot is known about the title, but from previous trailers, it seems to be an open-world adventure-focused game in the world of One Piece. The trailer that Bandai Namco released today, May 29, seems to really double down on this notion. 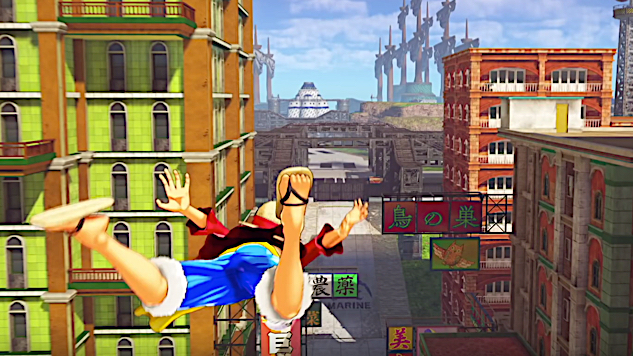 It showcases Monkey D. Luffy leaping, grabbing and quasi-flying his way around a gorgeous and visually varied open world. Exploration seems to be as pushed on the player as combat is, and the world looks interesting enough to maneuver through, given Luffy’s fun-looking traversal options. Hopefully, the game rewards player exploration with enough side activities, interesting fan service and so forth to warrant the game having an open-world/open-environment structure. Combat looks promising as well, as the game is played through a classic over-the-shoulder third-person perspective and Luffy’s combat capabilities seem varied. He has both ranged and close-up attacks that fluctuate between finesse and over-the-top brawler finishers. Also, the opportunity to take a stealthy approach is shown as we see Luffy sneak up on guards and take them out with some beautiful takedown animations, and the trailer even ends with Luffy hiding in a barrel as if he is channeling his inner Solid Snake. One Piece: World Seeker is a game that appears genuinely interesting, and has the opportunity to make something truly fresh and fun out of the One Piece IP. Fans have been wanting for a good One Piece game since the late 1990s. The trailer opens with the line “nothing ever stays the same,” so here’s hoping that this game delivers on being as original as it is well-made when it is released sometime later this year. Check out the gameplay trailer for One Piece: World Seeker below.